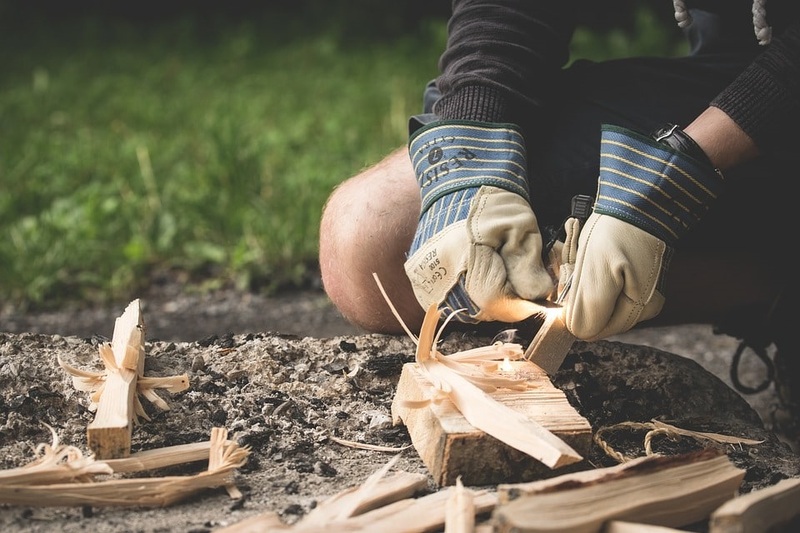 When you use a Poke N’ Stoke, building a fire is easier than ever, but there are still some tips and guidelines you should follow to be safe and get the most out of your campfire. 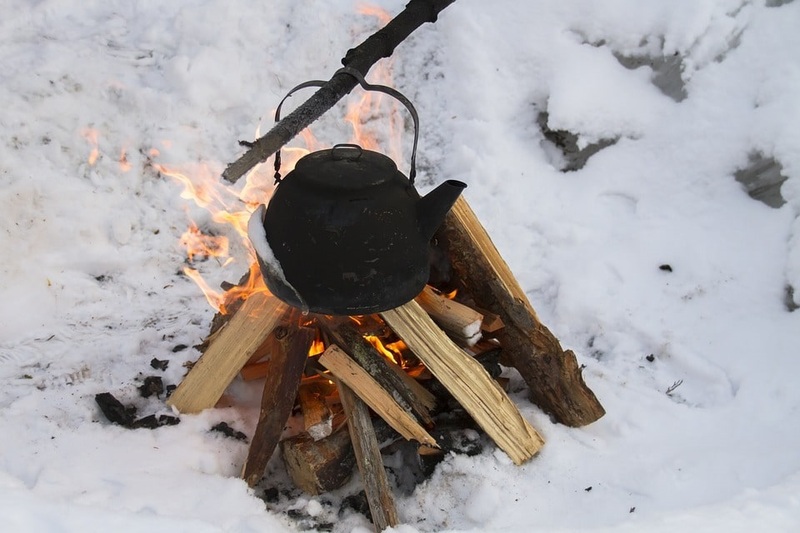 Here are some tips we’ve picked up over years of camping and building campfires. 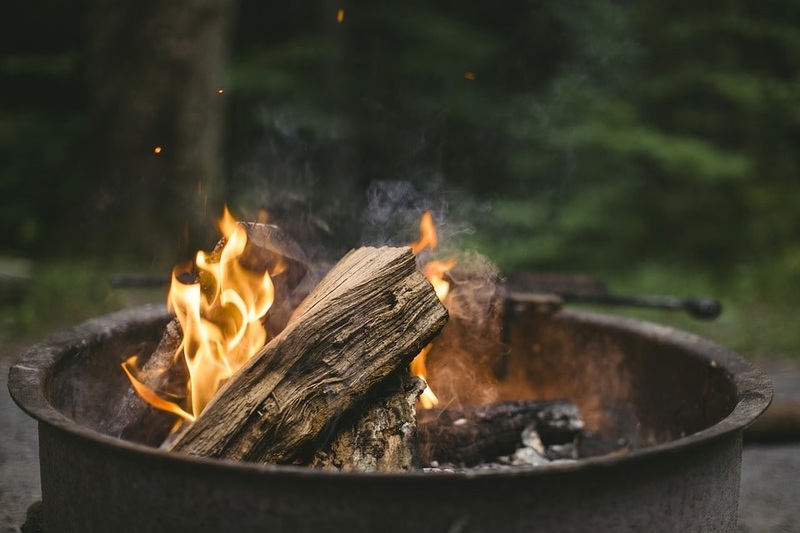 If you are in a campground, there should be fire pits, rings, or fireplaces already in place. You should only use these locations to prevent damaging the area or having your fire get away from you. Make sure that a fire is allowed, the campground owner or ranger will be able to tell you if the fire risk is too high for a campfire. If you are in an area that is not developed, check with the agency in charge before building a fire. This could be something like the Bureau of Land Management or the US Forest Service. You may have to get a permit from them before building your fire. In addition, use your best judgment, if the place looks like it might not be a safe place to build a fire, look elsewhere or just pass on having a fire. When building a fire, make sure that the pit or ring is free of flammable material before you begin adding your fuel. The base should be sand, gravel, or some other non-flammable soil. Make sure that there is enough room around the area that if embers were to fly away, they won’t start a wildfire. A good campfire needs three kinds of fuel: tinder, kindling, and firewood. Tinder is made of really small sticks, needles, dry leaves, and other natural items that are easy to light. Kindling is usually small sticks that can stoke the fire caused by the tinder. Ideal kindling is less than one inch in diameter. Lastly, firewood is large pieces of wood or logs. These pieces will keep the fire going until it runs out or you extinguish it. Many campgrounds prohibit you from bringing your own wood, to prevent insects from invading the area. Always use firewood sold at the campground or from nearby stores to protect the environment. If you have questions about firewood, contact the campground for information before you get there. If you are camping in an undeveloped area or backcountry, don’t bring firewood from more than 50 miles away. If you are going to use what you find where you camp, don’t cut down trees or limbs, even if the tree is dead. Some animals and birds use the dead trees and branches for homes, roosts, and more. Only use wood that is already down. 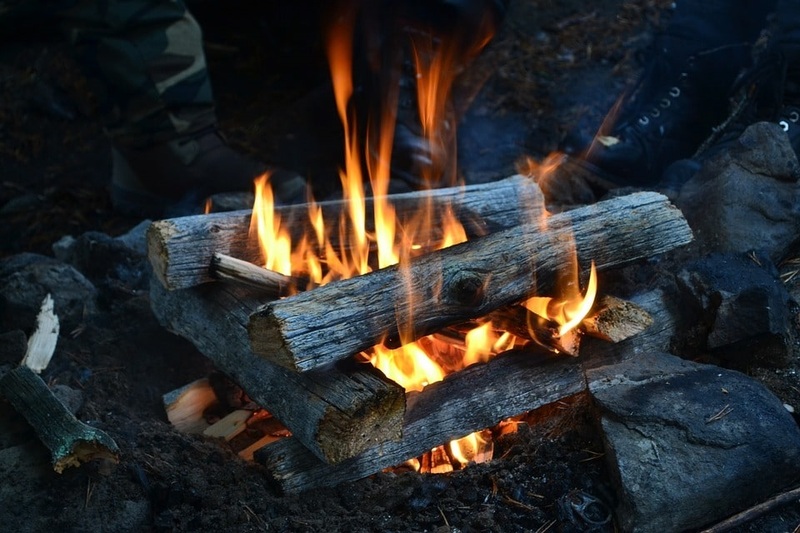 Use the Leave No Trace principles when gathering wood and building a fire. There is no one way to build a fire. If you have a method that works for you, then go with it. However, here are a few popular ways to build a campfire. Teepee: This is the one most people think of when they imagine a campfire. You’ll put a small pile of kindling down with a cone of tinder around it. Once this is burning nicely, you can larger pieces of wood around the fire, in a teepee shape. Pyramid: Also called “Upside Down”. Place a few of your largest logs side-by-side on the bottom. Then lay a second layer of smaller logs on top, but perpendicular. Continue this process, with each layer smaller than the previous one. When you have it to the height you want, place the kindling and tinder on the top of the pile and light them. Log Cabin: If you’ve ever played with Lincoln Logs, then you already know the basics of this fire. Place two large pieces of wood parallel to each other at the base of the firepit, with some room between them. The next layer is perpendicular to this, making a log square. Place your kindling and tinder in the square and proceed to add more logs in the same pattern. Once you’re at the end, place more kindling and tinder on top. Now for the fun part! Using a match, lighter, or other methods, light the tinder. Blow lightly at the base of the fire (or use your Poke N’ Stoke!) to provide the oxygen needed for the fire to grow. As the fire burns, you can use the poker part of your Poke N’ Stoke to move embers to the center of the fire. Enjoy your fire, but make sure that it is under control. Keep a bucket of water nearby to help keep the fire reigned in if needed. Once you are done with your fire, pour water on the embers, stirring the ashes and applying more water. Keep doing this until the fire is out and the ashes are cool to the touch. Do not leave a fire unattended or completely unextinguished. A small coal can start a devastating wildfire and you don’t want to be responsible for the loss of property and life. It is ok to burn trash, but only if it will be fully consumed. Do not try to burn metal, plastic, or styrofoam. If there is something left unconsumed after the fire, throw it away or take it with you. There should be nothing but ashes left when the campfire is done. Sitting around a campfire is one of the best parts of being in the outdoors. We hope these tips and your Poke N’ Stoke make your camping trip and fire a success!